Neighbors' participation in park design and development brings many benefits--and community involvement doesn't stop when construction is complete. The Trust for Public Land's focus on stewardship is one way we help create a positive impact and inspire long term change in Newark neighborhoods. 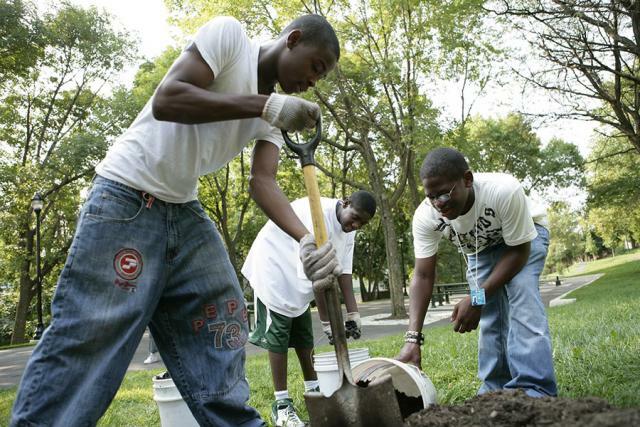 We currently support volunteer groups at Nat Turner Park, Jesse Allen Park, Mildred Helms Park, Quitman Street School, Mount Vernon Street School, Peace Park, McKinley Street School, Louise A. Spencer School, and Sussex Avenue School. As a result of Parks for People - Newark's organizing and coordination efforts, these volunteer groups founded United Parks as One, a network of Newark "friends" groups that shares best practices for community park support.